Dogs ear infections can trigger some very unpleasant symptoms for our pets and dog owners need to be very wary of the problems which can be caused by bacterial or yeast infection, allergies or foreign objects working their way into the ear canal. Fleas, mites and other parasites in dogs can lead to the ears becoming infected and bacterial infections can lead to some very serious symptoms. The first and most obvious thing to look out for is a reddening of the inner ear area. The other warning sign is if the ear starts discharging pus or fluid. Make sure you regularly inspect your dogs ears so that any problems can be caught at an early stage. Areas of skin becoming red and sore is a warning sign whenever they occur but if the infection extends into the inner ear than the dog could be in danger of losing its hearing. 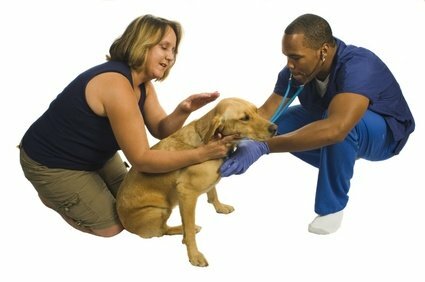 If the inner ear does become affected the dog will develop a high temperature and may have problems with his balance. If this happens swift treatment is required because the infection could cause the ear drum to rupture which will lead to deafness. Treatment is usually by ear drops if the ear drum is still intact. However, other avenues will have to be explored if the ear drum has been ruptured as drops could cause the dog to suffer coordination and balance problems. If your dog starts carrying its head to one side it may be an indication that some kind of foreign object has worked its way into the ear. This could be anything from a small piece of dirt to a grass seed. Of course, whatever the object is it needs to be removed, and the vet may be able to do this quite easily. Sometimes though the dog may need to be anaesthetised as the ear needs to be kept as still as possible. Dogs are susceptible to allergies and these can affect the ear. The ears becoming inflamed is often the first sign that a dog has allergy problems and that tests need to be done to determine the root cause of the problems. For more information see our pages on dogs skin allergies. An aural hematoma can occur when dogs ear infections lead to burst blood vessels in the ear flaps. When the blood vessels burst it causes a large blister, or hematoma, to form inside the ear flap. This blistered lump of skin needs to be drained and may need to be surgically removed. As we mentioned earlier a regular inspection of your dogs ears should be part of the routine checks you perform on your pet. Just a quick look inside the ears when you are having some chill out time with your dog is sufficient. If your dog is prone to attracting dirt into its lug holes you can help him out by using one of the approved ear cleansers that are available from vets and pet stores. It’s a quick job and easy to do - just remember to wipe away any the remnants of any debris that the cleaner picks up with cotton wool.